Blake Broder Earns coveted Senior Option Internship at The Montclair Dispatch, tasked with the Senior Spotlight series for 2018. At the end of every school year, through the Career Internship Program at Montclair High School, graduating seniors get the opportunity to participate in a four-week internship in a field of their choice. 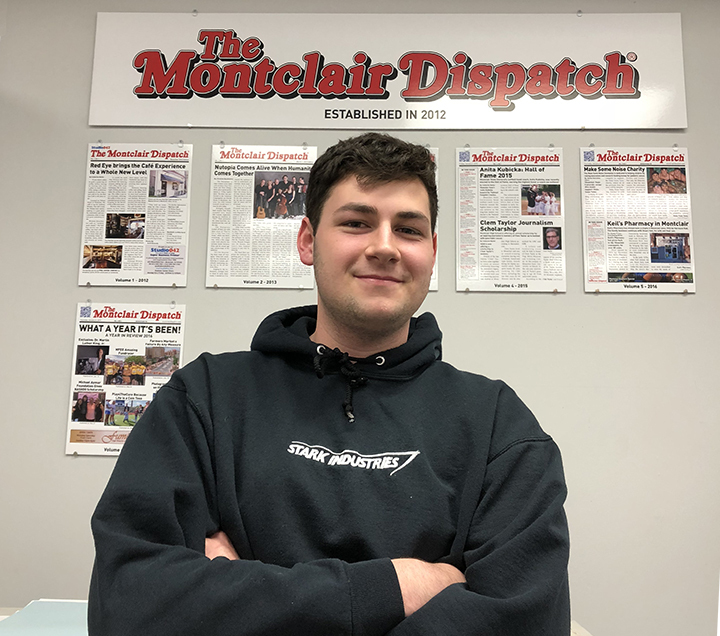 This year, Montclair High Senior Blake Broder chose to intern with The Montclair Dispatch, a local weekly serving the Montclair area, which is the only local paper printed here in Montclair by Studio042, Montclair’s resident business center, and print shop. I spoke to Scott Kennedy, the Publisher of The Montclair Dispatch, about Blake’s upcoming role with the publication. “Blake will be writing/editing/photographing and publishing his own articles during the four-week internship. Blake will continue our Senior Spotlight series focusing on four of his peers and their host employers. We have known Blake for years and will miss him when he heads out to college. As usual, Montclair must give up our brightest so the nation can benefit.” The Montclair Dispatch has for years supported Montclair High School Students through the Career Internship Program, which is more affectionately known as the Senior Option program. During his time at Montclair High School, Blake was a member of the costumes crew within the School of Visual and Performing Arts (SVPA), while serving as the Co-President of the HOMECorp Club and the Secretary for the Spanish Club. For Blake, the most impactful part of high school was as a member of the Center for Social Justice (CSJ), one of Montclair High School’s small learning communities. Blake thinks very highly of his high school teachers, most notably his Spanish teacher, Señora Levosky because of her encouragement for Blake to learn outside of his comfort zone, as well as his AP Language and Composition teacher, within CSJ, Ms. Bonvini, because of her enthusiasm in the classroom and the morning talks that she and Blake would share. Next year, Blake will be attending Occidental College in Los Angeles. He plans on studying Media, Arts and Culture, which seems well suited within the entertainment environment of L.A. Aside from the amazing weather, Blake says he chose the school because it is a small liberal arts college within a big city. Occidental College has 2,072 students, similar in size to Montclair High School, and is 2,775 miles away from Montclair, which could pose a large adjustment for many students choosing to attend college in California. Alex Rosen, a Montclair High graduate of the class of 2017, and a freshman at Pomona College in Claremont, California, provided some advice for other Montclair students making the trek across the country for school. Alex believes that students always overpack, and you do not need to bring nearly as much stuff as you think, especially when making such a long trip. He also emphasizes that it is important to come home as much as possible, even when going to school across the country. Blake will greatly miss his friends and the countless and unique memories that Montclair High School has provided throughout his four years. He is looking forward to working as an intern for The Montclair Dispatch for his Career Internship Program in order to learn more about the publishing industry and to learn more about himself as a writer and a worker.